The Council of Administrators and Supervisors honored eighteen outstanding public school administrators from Nassau and Suffolk Counties at the annual winter Delegate Assembly held on Thursday, March 14 at the Holiday Inn in Plainview. Each award-winning administrator was nominated by his or her peers and selected by the award committee for exemplifying the highest qualities of school administrative leadership, achievement, vision, innovation and collaboration with parents, students, staff and administrators in their school community. 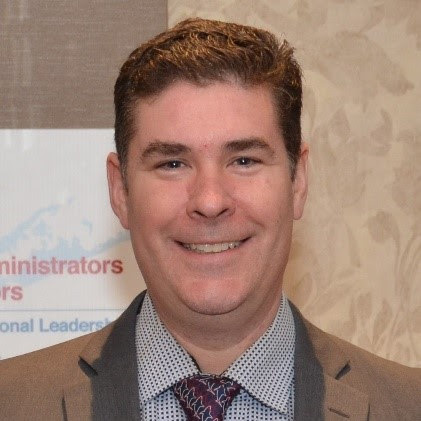 Among them was SFA Member James O'Hagan, Director of Facilities III at the Three Village School District in Suffolk County. Congratulations on this well-deserved honor! Applicant must not have received a previous award more than twice. Applicant must not have received a previous award in two consecutive years. SFMI's Accreditation programs enable members to broaden their knowledge, sharpen their skills and achieve key milestones that can move their careers forward. You'll be able to prove or gain competencies across the spectrum of facilities issues — from personnel management and technical systems to facilities management, safety and codes. We offer two different types of accreditation based on your membership. Affiliate members can pursue the Affiliate Development Certification (ADC) program, which will upgrade your skills and open doors to professional development opportunities. With technology changing so fast, and communities asking more of their facilities, school districts actively seek leaders who have demonstrated their skills, experience and commitment to learning. The ADC communicates that you are committed to your field and to professional development, making you a more desirable candidate as you seek to move forward. After successfully completing your ADC, you can move on to earn your Advanced Affiliate Development Certification (AADC), which consists of 13 additional competencies, an Accreditation Committee Review and interview. Offer opportunity for greater earning potential and career advancement. If you have not worked five years in the operation and maintenance of educational facilities but you meet all the other requirements, you can obtain your Registered Director of Facilities (RDF) certificate. Then, at your fifth anniversary of working as a director of school facilities, you will receive your CDF. If you have questions, please contact Mike Cocca at sfmi@nyssfa.com or 518.465.0563. An $8 million capital project to improve security, learning spaces and sports facilities in the Florida Union Free School District became a real deal on Thursday, when board members gave the funding structure its final approval. Voters had approved the $7,985,804 project on Feb. 26. The board’s most recent action approved a bond resolution for $5,985,804, the amount needed to cover the $5.2 million that state building aid will pay. The rest of the funding will include $2 million from the district’s capital reserve fund and $785,804 from local property taxes. The board estimates a taxpayer with STAR and a home assessed at $200,000 will see an $11 annual increase for five years; those with Senior STAR will see an estimated $8 increase. About $3.9 million will be spent in each district school: Golden Hill Elementary and S.S. Seward. The largest expenditures will be for increased security, including construction of security vestibules at both schools. A $26.5 million capital project would bring upgrades to classrooms and facilities at Salmon River Central School. Approved by the School Board in February, it will go up for public vote on Tuesday, May 21, at the same time as the annual budget vote. "After careful collaborative planning, I am proud to announce that this project requires no additional taxes to the Salmon River CSD community,” Superintendent Dr. Stanley Harper said in a press release. The project would pick up where the work overwhelmingly approved by voters in 2008 and 2013 left off. Those earlier capital projects expanded the elementary, middle and high school areas, redesigned and enhanced the learning environment, improved safety through district-wide security enhancements, created a state-of-the-art fitness center and addressed basic infrastructure repairs, according to a district press release. These are two of the startling findings contained in a report, “Get the Lead Out,” published Thursday by the U.S. Public Research Interest Group (USPIRG) Education Fund and Environment America Research & Policy Center.